Clockwise from top left: Sarah Liddell, Tom Holt, Esther Neisen, Mike West, Yames Moffit, and Mickey Harmon. A group of six friends and artists are on a mission to bring an art gallery back to the west side of Allentown. Those artists—Mickey Harmon, Sarah Liddell, Tom Holt, Mike West, Esther Neisen, and Yames Moffit—will use the space to display and sell their artwork—from watercolor paintings and digital pop-art designs to strange plush toys and t-shirts—as well as display and sell the artwork of new and fresh artists on a rotating basis. 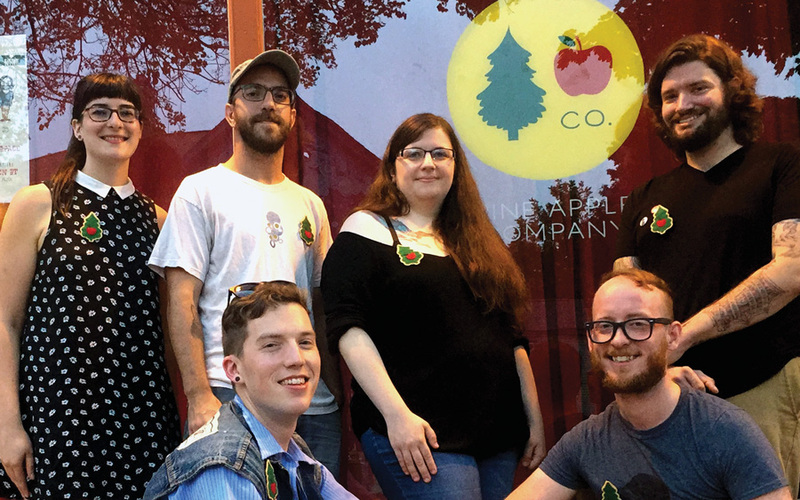 They’ll open their shop, Pine Apple Company, at 224 Allen Street, the former location of Glow Gallery and adjacent and connected to the new LGBTQ-focused shop, No Labels Clothing Cooperative, on Friday, September 2, just in time for this month’s Allentown First Friday Gallery Walk. The idea to open the shop came up during one of the group’s regular sketch nights—basically get-togethers where they’d all work on their personal art projects—which took place at Holt’s house. “[Sketch night] really was me being a little bit agoraphobic. I hate bars, and I really wanted to draw people to my house to hang out with me. So it was literally just me with Netflix but I’d be like, ‘It’s sketch night!’” says Holt. The artists, who range in age from 26 to 35, feel more driven when they’re working together in the same room, even if they’re working on different projects, Moffit says. Harmon agrees. The group had their eye on the space at 224 Allen Street for a while. After a some soul-searching and thinking, they decided to move forward. Tom Holt paints a sign for Ted’s Hot Dogs that he collaborated with Yames Moffit. 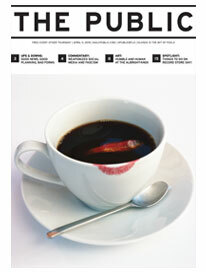 Holt has experience doing preparator and assistant curating for local galleries. Moffit is a trained sign painter with a degree in illustration. Niesen does sculptural work and also hand-sews tiny, strange stuffed animals—you may have seen her “Lumpy Buttons” at places like Thin Ice. Harmon and Liddell work at a local publishing company as designers of educational children’s books by day, and by night are visual artists. West is a designer and videographer for a health insurance company. With his experience as a curator and preparator, Holt looks forward to working with new artists. The large wall on the west side of the store will be reserved for featured artists, who will rotate regularly. “That’s the element of what we’re doing that’s hopefully giving back to the community and just trying to create opportunity for artists. I hope to not only curate some underserved artists, but also show them a few things about framing and presentation,” says Holt. The artists hope to incorporate some workshops and classes into their mission too. Walking or driving by the storefront, it’s impossible to miss the beautiful signage, designed collectively by the group and hand-painted on the windows of the store by Moffit. You may have seen Moffit’s sign work at places like Ted’s Hotdogs on Chippewa and Hydraulic Hearth in Larkin Square. Mural by Yames Moffit at Sato Ramen at 3268 Main St. Inside the store, there’s a digital art piece—Roddy Piper’s character from the film They Live—sitting on a stand. “I came here to do two things…” Mike West says as he walks over. “A lot of his best lines in that movie were ad-libbed,” West informs me. His day job is not very glamorous, he says, but he likes it and he enjoys the opportunity to start this new project. On the table in the middle of the store there is a pile of prints of different varieties of mushrooms. The prints, originally watercolor paintings, were created by Liddell as part of Sugar City’s Fun-a-Day Project, where artists create one piece of art every day for a month. She saw the mushrooms in a book she was designing at work. Niesen might have the most diverse collection of artwork in the store. On one shelf she has light boxes with film negatives cut and glued in to create 3D collages of insects. “I love insects,” she says. “I love anatomy. That was my focus in school and that’s where my real love lies, so each one is like a whole new challenge—learning a whole new set of how [the insects] go together.” On another shelf she’s got a collection of tiny plush toys—one is a cute little purple bear with insect wings—which she sews herself. She originally started making them to pay for her cat’s tooth surgery, and eventually they started funding her fine art shows. Felt cats by Esther Niesen. Harmon’s designs have been featured all over Buffalo, including within the pages of The Public. He’s co-created three books: The Life and Times of Grovey Cleves, written by Scott Mancuso, A Pie-Eyed Night with Peggy O’Neil, written by Margaret Finan, and most recently New Buffalo, a satrical graphic novel written by Dana McKnight. His designs and illustrations are colorful, fun, and sometimes psychedelic. He explains how they came into this space. The building is owned by Michael Rizzo, publisher of the LGBTQ-focused publication Loop Magazine. “Mikey Rizzo is a pillar of the community,” says Harmon. “He bought the building a few years ago with the hope of Glow being in here, owned by an LGBT individual, and then the Pride gift shop. Marcus [Wise] was here for three years with a gallery and he did a fine job of getting new artists in here every month. As soon as he left, Mikey very much wanted to keep a queer angle to things, so when I approached him about this he said, ‘No Labels is coming in and I’m definitely going to give them a space because they’re the kind of movement I want to get behind.’ So I think this is a perfect marriage of that, and also I’ll be able to pull LGBT artists in on this side too,” says Harmon. The group intends to work closely with their neighbors, the No Labels Clothing Cooperative. Felix Spencer Keigh, one of the worker/owners of No Labels, looks forward to building the community around the two shops. The Pine Apple Company will be open Wednesdays through Sundays. Wednesdays and Thursdays will be daytime hours; Sundays the store will be open for half of the day, and they’re hoping to stay open late on Fridays and Saturdays. “We want to offer people something to do in the early evening other than just bar, bar bar,” says Holt. Right now there are a few non-bar or restaurants on west end of Allen Street. Pawprints by Penny, a dog-care establishment; Picasso Moon, a clothing boutique; and the antique store, Antique Man. With the arrival of No Labels Clothing Cooperative and Pine Apple Company, the block has become a great place not only to dine and drink but to shop too. The biggest challenge so far is having the confidence to move forward with the project, says Holt.